The ruins of Mitla are believed to be the remains of a mysterious town called Mictlan, which translates to “Abode of the Dead”. Mictlan was described by early Spanish chroniclers as being a place where the Zapotec and Mixtec people buried their elite. The Zapotec called this place Lyobaa, which translates to “burial place”, because they believed it had a tunnel to the underworld. Building 2: Could this have been the Temple of the Underworld? 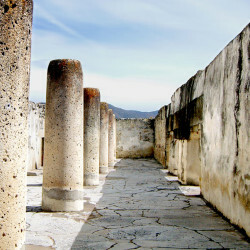 The legends surrounding Mitla begin deep in antiquity. 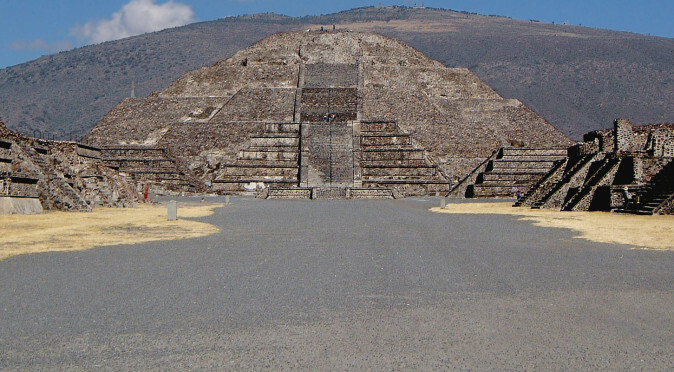 Zapotec folklore says that the builders of the city lived in a time before the sun and when the sun appeared they tried to flee back to the underworld, but were turned to stone. The stone idols became a source of great mystic power and were at the heart Mitla’s importance. 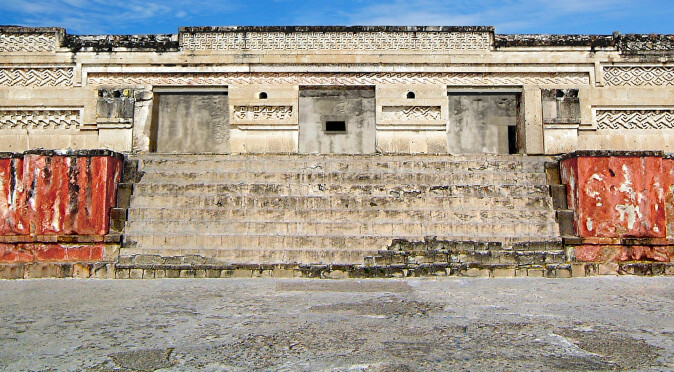 Having access to ancestors from a previous epoch, an era of the Gods, made Mitla a place that attracted the elite from across the Kingdom who wanted information and power from these relics, and to pass into the underworld with them. But it wasn’t just the stone relics that people were interested in, but also the tunnel in which they were found. 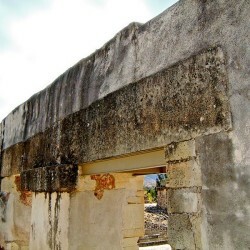 This excerpt, contemporaneous with the town still being actively used by the Zapotec, marries the name Mictlan with a description of the buildings that are found at the archaeological site of Mitla. This brief description also hints at Mitla’s preoccupation with the underworld – a theme which is later described concisely by another Christian chronicler, Francesco de Burgoa. “The outside is of such extraordinary workmanship that on a masonry wall about an ell (yard) in height there are placed stone slabs with a projecting edge, which form the support for an endless number of small white stones…which are as smooth and regular as if they had all come from one mould. They had so many of these stones that, setting them in, one beside the other, they formed with them a large number of different beautiful geometric designs, each an ell broad and running the whole length of the wall, each varying in pattern…what has always seemed inexplicable to the greatest architects is the adjustment of these little stones without a single handful of mortar, and the fact that without tools, with nothing but hard stones and sand, they could achieve such solid work that, though the whole structure is very old and no one knows who made it, it has been preserved until the present day”. “When he entered the chapel they put on him a long white cotton garment made like an alb, and over that a garment shaped like a dalmatic, which was embroidered with pictures of wild beasts and birds; and they put a cap on his head, and on his feet a kind of shoe woven of many coloured feathers“. “[The High-Priest] bowed low before the idols…and then in quite unintelligible murmurs he began to converse with these images, these depositories of infernal spirits, and continued in this sort of prayer with hideous grimaces and writhings, uttering inarticulate sounds, which filled all present with fear and terror, till he came out of that diabolical trance and told those standing around the lies and fabrications which the spirit had imparted to him or which he had invented himself”. “When human beings were sacrificed…the assistants of the high-priest stretched the victim out upon a large stone, baring his breast, which they tore open with a great stone knife, while the body writhed in fearful convulsions, and they laid the heart bare, ripping it out, and with it the soul, which the devil took, while they carried the heart to the high-priest that he might offer it to the idols by holding it to their mouths… and the body was thrown into the burial-place of their ‘blessed’, as they called them”. “The last (underground) chamber had a second door at the rear, which led to a dark and gruesome room. This was closed with a stone slab, which occupied the whole entrance. Through this door they threw the bodies of the victims and of the great lords and chieftains who had fallen in battle – and they brought them from the spot where they fell, even when it was very far off”. “many who were oppressed by diseases or hardships begged this infamous priest to accept them as living sacrifices and allow them to enter through that portal and roam about in the dark interior of the mountain, to seek the feasting-places of their forefathers…and on account of this horrible abyss they called this village Liyobaa”. “[The people of the Gospel] learned from the stories which had been handed down that all were convinced that this damp cavern extended more than thirty leagues underground, and that its roof was supported by pillars. And there were people, zealous prelates anxious for knowledge, who, in order to convince these ignorant people of their error, went into this cave accompanied by a large number of people bearing lighted torches and firebrands, and descended several large steps. And they soon came upon many great buttresses which formed a kind of street. They had prudently brought a quantity of rope with them to use as guiding-lines so that they might not lose themselves in this confusing labyrinth. And the putrefaction and the bad odour and the dampness of the earth were very great, and there was also a cold wind which blew out their torches. And after they had gone a short distance, fearing to be over- powered by the stench, or to step on poisonous reptiles, of which some had been seen, they resolved to go out again, and to completely wall up this back door of hell. The four buildings above ground were the only ones which still remained open, and they had a court and chambers like those underground; and the ruins of these have lasted even to the present day”. “One of the rooms above ground was the palace of the high-priest, where he sat and slept, for the apartment offered room and opportunity for everything. The throne was like a high cushion, with a high back to lean against, all of tiger-skin (probably actually Jaguar), stuffed entirely with delicate feathers, or with fine grass which was used for this purpose. The other seats were smaller, even when the king came to visit him. The authority of this devilish priest was so great that there was no one who dared to cross the court, and to avoid this the other three chambers had doors in the rear, through which even the kings entered. For this purpose they had alleys and passage-ways on the outside above and below, by which people could enter and go out when they came to see the high-priest. . .The second chamber above ground was that of the priests and the assistants of the high-priest. The third was that of the king when he came. The fourth was that of the other chieftains and captains, and though the space was small for so great a number, and for so many different families, yet they accommodated themselves to each other out of respect for the place, and avoided dissensions and factions. Furthermore, there was no other administration of justice in this place than that of the high-priest, to whose unlimited power all bowed…All the rooms were clean, and well furnished with mats. It was not the custom to sleep on bedsteads, however great a lord might be. They used very tastefully braided mats, which were spread on the floor, and soft skins of animals and delicate fabrics for coverings”. 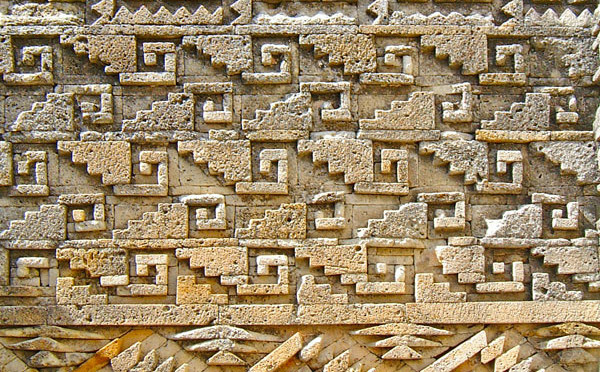 Burgoa’s descriptions of Mitla give us an incredible insight into the workings of this mysterious city. Undoubtedly the archaeological site is one and the same as that which Burgoa describes, but where is this underground passageway? Burgoa describes the High-Priest as operating and living in a structure with four rooms above ground and four rooms below. He also mentions the pillars and the lintels that match those found in Mitla’s most iconic and presumably most important building, Building 7. Fig MTU01: San Pedro ChurchChristians to have blocked a “back door to hell” would have been to build a church over the top of it. One church fits the bill perfectly, the Church of San Pablo, which sits in the North Group (also known as the Church Group). It would therefore seem most likely that the North Group are the Temple of the Underworld. 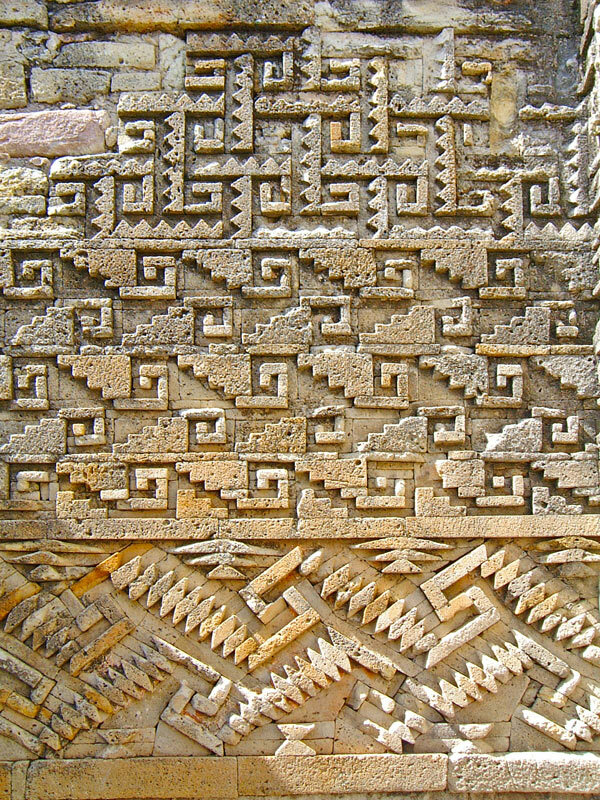 The North Group is amongst the oldest of those found at Mitla and the most decorated, with intricate stonework and mural paintings. The mural paintings are extensive and are believed to tell the story of the Zapotec creation myth, which is very fitting if this group is the Temple of the Underworld. The group does also contain columns, two of which are still visible outside the church, as can be seen in figure MTU01. Ultimately, it is slightly irrelevant to identify exactly where the Temple of the Underworld was located within the site. What Burgoa provides here is an excellent insight into the religious order of the Zapotec civilisation and the power wielded by the High-Priest of Mitla. Through his writings we can see how important it was to be buried amongst greatness and how important these great buried ancestors were. 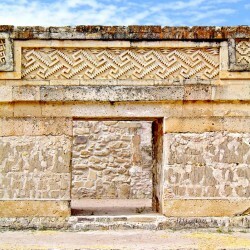 Mitla was undoubtedly a very important religious centre whose success, wealth and power was built around its prestige as a resting place for those who wanted to be buried with the gods. This in turn made it the primary centre for contacting great spirits for advice, prophesies and curses. Undoubtedly, a lot of money would exchanged hands to ensure a burial within the town or to employ the services of the High-Priest to contact ancestors – and this wealth can be seen in the few ruins that remain. 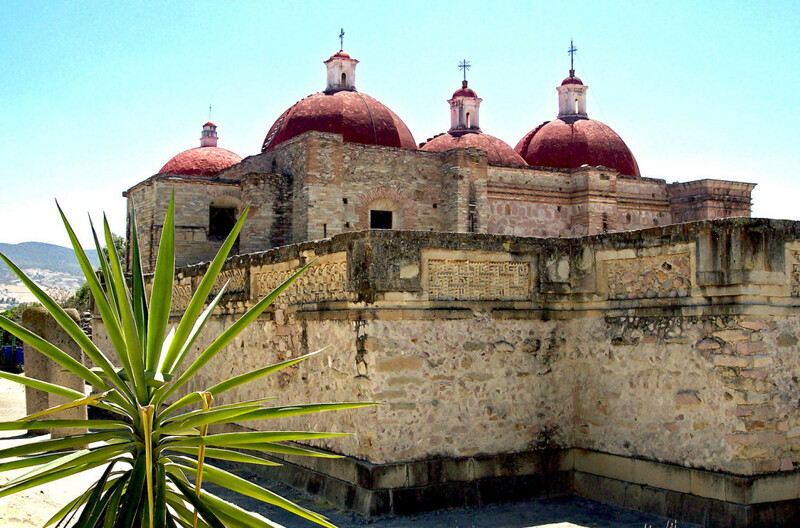 What is without doubt, is that Mitla is indeed the “Abode of the Dead” and the home to the Temple of the Underworld. All the quoted excerpts used in this article are actually taken from a book by Lewis Spence, entitled Myths of Mexico and Peru, first published in 1914 (ISBN 0-89341-031-4 or available to download from here: //archive.org/details/mythsofmexicope00spen).